Siena is a city in Tuscany, Italy. It is the capital of the province of Siena.The historic centre of Siena has been declared by UNESCO a World Heritage Site. It is one of the nation's most visited tourist attractions, with over 163,000 international arrivals in 2008. 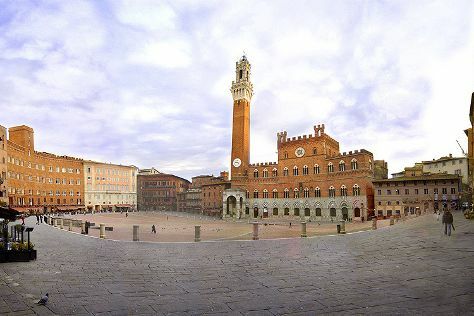 Siena is famous for its cuisine, art, museums, medieval cityscape and the Palio, a horse race held twice a year.HistorySiena, like other Tuscan hill towns, was first settled in the time of the Etruscans (c. 900–400 BC) when it was inhabited by a tribe called the Saina. The Etruscans were a tribe of advanced people who changed the face of central Italy through their use of irrigation to reclaim previously unfarmable land, and their custom of building their settlements in well-defended hill forts. A Roman town called Saena Julia was founded at the site in the time of the Emperor Augustus. Some archaeologists assert that Siena was controlled for a period by a Gaulish tribe called the Senones.According to local legend, Siena was founded by Senius and Aschius, two sons of Remus and thus nephews of Romulus, after whom Rome was named. Supposedly after their father's murder by Romulus, they fled Rome, taking with them the statue of the she-wolf suckling the infants (Capitoline Wolf), thus appropriating that symbol for the town. Additionally they rode white and black horses, giving rise to the Balzana, or coat of arms of Siena with a white band atop a dark band. Some claim the name Siena derives from Senius. Other etymologies derive the name from the Etruscan family name Saina, the Roman family name Saenii, or the Latin word senex "old" or its derived form seneo "to be old". Province of Siena is in Tuscany. Use our Italy day trip planning tool to arrange your visit to Province of Siena and any other destinations in Italy that take your fancy.